The International Coastal Clean-up is an annual drive done every third Saturday of September where thousands of volunteers from around the world participate in clearing the coastlines, lakes and rivers of trash. Recording every piece of trash collected is part of the exercise. From the data collected, policy-makers on environment can make better decisions and recommend ordinances. The volunteers soon found out that the top four non-biodegradable wasters are cigarette butts, plastic bottles, food wrappers and plastic grocery bags. 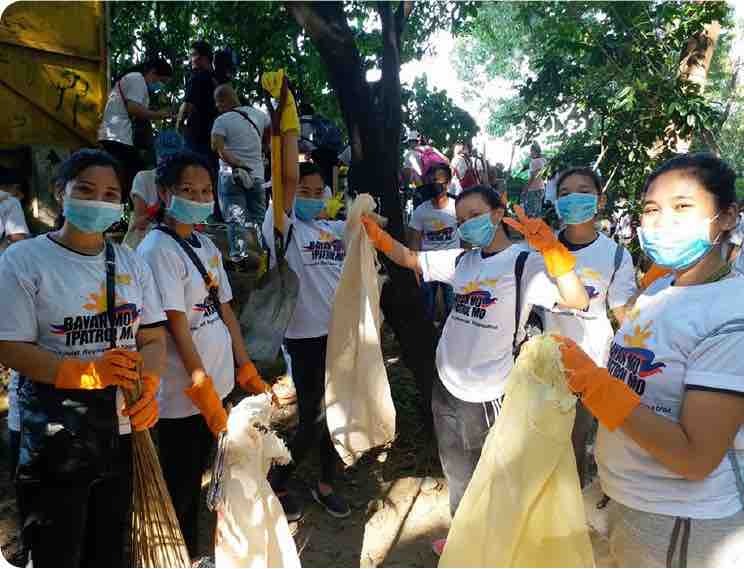 Graduating BS Tourism students of St Paul University Quezon City volunteered at the 32nd International Coastal Clean-u[ held at PUP Ferry Station on September 16, 2017. Call time was at 6:30 AM. Some students were still quite heavy with sleep when they arrived on the site while a few others took their sips of hot coffee as they brace themselves for the hard work that lay ahead. Using the school’s bus, the eager batch stopped right infront of the gates of the Polytechnic University of the Philippines. At its quadrangle, SPUQC students were joined by other volunteers from STI, PUP, Philippine Coastguard, Pasig River Rehabilitation Commission, Bantay Kalikasan and ABS-CBN. The latter encouraged everyone to chant in front of the camera the following slogans: “Bayan Mo, i-Patrol Mo. Isang Dekada, Isang Pamilya” and “Every Filipino, An Earth Warrior.” It took the volunteers several takes to get the perfect video. But they got it nonetheless. A short ceremony was led by PUP President, Mr. Emanuel de Guzman. He assured everyone that the coastal clean-up is a very laudable effort as every step they’ll make is protecting the patrimony of the next generations. Afterwards, Team Leaders were assigned to many groups. They brought papers and walked them through the system of the entire cleaning. The organizers provided cleaning implements such as rakes, tongs, gloves, masks, sacks, etc. for everyone. The SPUQC students were assigned to clean the area of the ferry dock. Assisted by the Philippine Coastguard, they started picking up bottles, plastic containers, candy wrappers and cigarette butts (all biodegradable and non-biodegradable trash combined) around the ferry station. To ensure that they will get in better mood and speed, music was played on loud speakers. While doing this activity, I was greatly moved by how our small acts can damage our surroundings. Most of the trash I picked up and collected were candy wrappers that we can easily purchase in convenient stores and after putting the candy in the mouth, the wrapper was carelessly thrown to the wind. I don’t know why people are having difficulties in just holding or putting the trash for awhile in their pockets and when the opportunity presents itself to throw these in garbage bins. I learned from this experience that the environment won’t clean itself for us, but we, ourselves, clean the environment for what we did. We are God’s greatest creation, the stewards of His creations, yet, we are the ones sho destroy it. I was frightened with what I saw, thinking what the next and upcoming generations will see. The experience was great because it gave me an opportunity to become a volunteer for a day, to be part of this advocacy awakened me to hear the cry of Mother Earth to be more responsible towards the environment. It dawned on them that the clean-up projects are not the real solution to lessen the pollution, as commendable as this bayanihan was. What’s needed is discipline. It starts with the small things of segregating one’s garbage, consciousness in not anymore using plastic and in discriminately disposing one’s rubbish in bins. Discipline will make everyone an earth warrior.